It’s likely that the guitar pickup ranks among the greatest guitar innovations of all time. Without these transducers made of magnets wrapped in copper wire, we’d probably never have known the transcendent reinvention of the guitar by the likes of Jimi Hendrix as he shredded six strings in a way that no one had previously heard. The overdriven amp tones that spawned entire genres of music like rock and metal also would have slipped by. Would Black Sabbath have had as much of an impact or any at all as an acoustic group? Probably not. The will to amplify the guitar came about via necessity as big band music like swing took dance halls and performance theaters by storm. A large and loud horn section simply drowned out acoustic guitars meaning that electrical amplification would be needed for guitar inclusion. 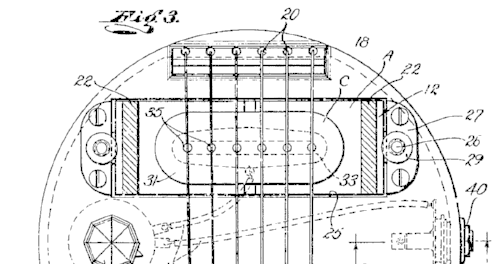 During the 1920’s several inventors were hard at work engineering and developing ways to pass sound through a stringed instrument and into an electric amp. In 1924 Gibson was able to produce a pickup for a viola that passed the string vibrations through the bridge of the instrument. It worked, but was limited due to the very weak signal it produced. It wasn’t until 1932, some ten years later, that a commercially viable and available pickup hit the market. In that ten years, engineers had applied electromagnets within their pickups placed directly under the strings instead of depending on the bridge to transfer energy creating a strong and usable signal. The “frying pan” guitar, as it became known, was produced by Rickenbacker and sold commercially as the first electrically amplified guitar that would kickstart a century of electric tone chasing, overdrive, and both music and instrument evolution. It’s Like Magnets and Magic Or Something? 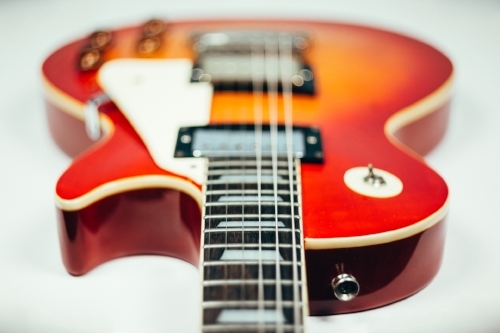 Without an electrical engineering degree in one’s belt, it can be a daunting task to understand electric current, transducers and how they all work within a pickup and an electric guitar. But if you know how a magnet pushes and pulls it can at least stand as a basis for understanding. That’s because at the core of many of the most popular pickups today are electromagnets. If you’ve ever taken two magnets and pushed them together against their polarities you’ll notice a force, known as the magnetic field, pushes the two magnets away from each other. Using strings that react well with magnets, like cobalt, nickel, or steel and striking them to vibration causes an interference in that invisible magnetic field. That interference causes the magnets to create energy that can be converted into sound as the field fights against the vibrating strings and is transferred into energy via the closed circuit copper wiring that wraps around the magnets. This transfer of energy via magnets is called Faraday’s Law of Induction and is the core principle behind the science of transformers, generators, electrical motors and guitar pickups too. Now, this is an extremely simple way to describe what is scientifically occurring that avoids many elements including complex equations and math. Even the way with which the strings vibrate at different harmonics plays a role in how the magnetic field is disturbed, but this explanation should work as a general basis for how a pickup takes the vibration of a string and transfers it into energy and eventually sound. In today’s market, there are so many pickup variations and options that it can be downright cumbersome digging through the sea of pickups with seemingly only minute differences. Fender’s Custom Shop alone offers some 15 different types of pickups for Stratocasters alone, not even including the scores of Telecaster, Jaguar, Jazzmaster and bass guitar pickups, and that’s just one company. So what’s the difference really? The pickups output, or the amount of signal that gets transferred to the amp remains the single most important factor in determining both the tone and overall drive of a pickup. Pickups with high output also called “hot pickups”, will cause an amp to become dirty or distorted more easily as it pushes the amplifier beyond its limits. The hotter the pickup, the more readily the amp enters oversaturation. Using the exact same amp with the exact same settings, but instead playing with a pickup that has moderate output will pump less into the amp, thus it will sound cleaner, and less distorted, generally producing a brighter tone. Essentially, the higher the output, the more easily amp distortion will occur. The first pickup style produced when George Beaucamp finalized his design using two giant horseshoe style magnets, the single coil remains among the two most popular pickup styles along with humbuckers. When you think of vintage Fender tone from both Strats and Teles, a single coil is likely to have been the pickup used. Buddy Holly and Hendrix played them, as well as Stevie Ray Vaughan, Jeff Beck, John Frusciante and a legion of classic guitar players. The single coil is the original. It is clear, bright and shimmery, and shines in a vast wealth of music. As amplification grew louder, however, one thing also became clear - single coils can tend to “hum”. This notorious hum, called 60-cycle hum, is an unfortunate byproduct of single coil pickups coming from interference produced by other electrical devices like appliances and lights. So on a bar stage full of plentiful lights, and scores of other electronic devices, it can be a nuisance. Play music that is high gain, at high volumes and also at the bar and you can approach levels of hum that just don’t add value to your sound or tone. This can mostly be alleviated by fantastically done shielding inside the pickguard, but often those that are playing higher gain rock and metal tend to skip on the single coils altogether, opting for humbuckers instead. It should absolutely be noted that today’s single coils are coming in high gain flavors that rival any humbucker tone and the hum issue alleviated, even killed off by some single coil pickups such as the Fender Noiseless variety. Technically P-90s are single coil pickups by design, however, they offer such a unique stance in tone and capabilities that they earn their own spot among the realm of pickups. Developed by Gibson and often called soap bars for their similar contours and shape, P-90s are the loud-mouthed, bigger sounding cousins of the original single coil producing higher gain. Meaning more distortion while still producing a rather clear tone and filling a nice little niche between single coils and humbuckers as they found their place with early heavy metal such as Black Sabbath. Why do they sound different? In short, the traditional single coil has alnico pole pieces for magnets which are the silver circles seen poking from singles, while the P-90 has a bar magnet underneath similar to that of a humbucker which certainly affects the fullness and tone. Given the single coil design, P-90s are also stricken with the potential for hum. This is what led Gibson to the invention of the humbucker, causing the P-90 to fall out of favor by Gibson during the 1950’s. However it’s unique blend of full sound and clean tones make it a notable vintage pickup style. With musicians complaining that they couldn’t “go to 11” with single coils without painstaking hum, Gibson set out to explicitly “buck the hum”. Enter the humbucker guitar pickup, now notorious with Gibson guitars, engineered by legendary Gibson employee Seth Love and produced by placing two single coils side by side. The magic happens when one coil’s magnets are placed with the magnet’s north end “up” (towards the strings) and the other coils’ are placed south end up. This opposite polarity causes a vast reduction in the interference picked up allowing the humbucker to produce dramatically higher gain output without the extra noise. The humbucker, as a result, produces objectionably thicker tone, called anything from dark to fat and offering up a fuller overall sound. The higher gain and more distortion without the added noise made them synonymous with heavier rock, and metal from slayers like Eddie Van Halen, Slash, and Zack Wylde. Sounds like absolute guitar perfection right? Well, they too come with their own caveats. Namely, some clarity is lost in the fuller sound making individual notes sparkle less, creating a tone often noted as “murky” or “muddy” while simultaneously giving less depth within a player’s attack. Not to fear though, as with single coil innovations, humbuckers have also seen a score of renditions from rail humbuckers, mini-humbuckers and perhaps most versatile, splittable humbuckers which allow you to isolate one of the individual single coils within the humbucker producing nearly identical single coil tone. The majority of popular pickups installed in guitars today are considered passive. That is they only act as transducers to electromagnetic fields. Active pickups still consist of coiled copper, albeit less, spun around magnets but are also separately powered by battery as a preamp. Less wiring gives these pickups a low base output before it hits the battery powered preamp which means a lower magnetic field adding more sustain and, unlike passive humbuckers which change tone completely when the volume is rolled back, active pickups will stay the same. This is both a positive and a negative as it does limit the overall dynamics of your sound, which some like to coin as a more sterile or cold tone. Nevertheless, active pickups like EMGs remain favorites to the heaviest of metal players because they are chunky and loud and offer up many benefits from the low preamp output that neck shredders love. Piezo pickups sit alone in their own world within the guitar pickup universe. Unlike every pickup previously listed, Piezos do not use magnets wound in wire to interpret the string’s vibrations into sound. Instead, a Piezo styled pickup not only offers a completely different sound but also picks up no magnetic interference at all. Without a magnetic field to translate the vibrations, a Piezo instead works by interpreting pressure from the vibration of both the strings and the instrument's body. Because of this, Piezo pickups are almost exclusively featured on acoustic instruments. Much like active pickups, Piezos offer such low output initially that they must also be run through a preamp, but without magnets, their dynamic range grows exponentially creating a tone that some may feel is too true. This means that it is difficult to shape or change the initial tone created. This can be limiting for the electric guitar but works well in acoustic instruments as it brings out the true sound of your acoustic for better or worse. While all these pickups offer up variations, perks, and deterrents that will assist you in getting the desired tone that you want. The reality is that there is no hard set rule about which pickups you have to use and for which genre. Experimentation can lead to valuable lessons, and what may sound great to you can make another’s blood curdle. Nevertheless, the greatest musicians take the rules and absolutely bend them into new shapes, ideas and sounds. Don't be afraid to try everything out, research what your favorite artist prefers or what was used for particular songs of which to you the tone is divine, and even if you still don’t have your electrical engineering PHD., you’ll be well on your way to creating which is far more important than which pickups you have.